Griddles and woks have the ability to develop high heat flavor. If you look around the world there are far more of them than you see of traditional gas and charcoal grills. 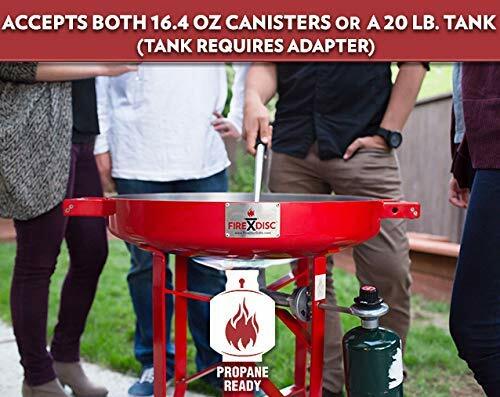 This prompted BTI outfitters to offer their propane-fired 24-inch FireDisk, for outdoor cooking enthusiasts. Their consumer focus is on providing hunting, fishing, outdoor, camping, RV, and sporting goods. The FireDisk is described as being like a “Grill Without Grates, or a Wok Wit Walls.” You can treat is like a slightly contoured griddle, yet it is capable of being much more. While it certainly can sear food and create some world class stir fry, it can also be used as a fryer. It was also designed to be very portable as well as easy to assemble. It breaks down into easy to haul pieces that set up without needing to use tools and complicated fasteners. 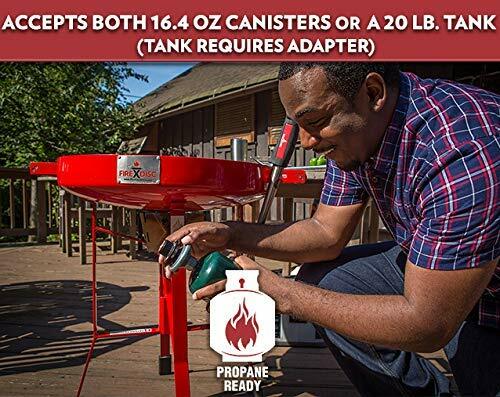 The FireDisk is also set up to run off a simple 1-pound portable propane tank. 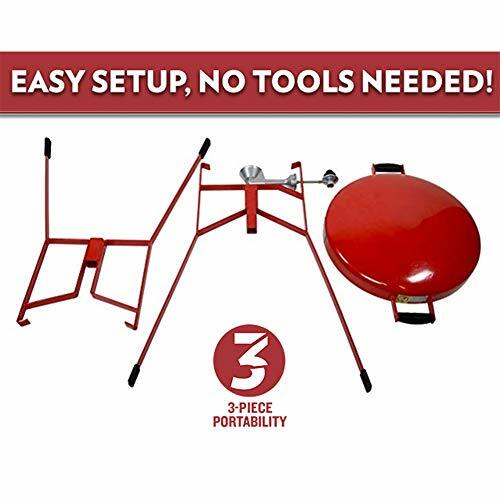 This means you can easily pack it up for a camping, hunting, or fishing trip, and quickly set up your camp kitchen. At the same time, it can also be used as a vacation cooking station, or if you want a head-turning way to cook at that parking lot tailgate party. You would probably have to take out a stopwatch to know for sure, but I think it actually takes longer to unbox the 24-inch FireDisk than it is to assemble. When it comes to the materials, the pedestal base is relatively secure considering the size of the FireDisk. While BTI says you can clean it up with a basic wipe down with some water and a damp rag, it’s better to treat it like you would a seasoned griddle. This will help to prevent rusting and corrosion issues while also imparting superior flavor as well as non-stick properties. The 24-inch FireDisk is very versatile. You can fire it up, and in a few minutes, it’s ready to sear up some hamburger patties, and bratwursts. Yet you shouldn’t think of it just for traditional lunch and suppertime foods. So long as it is properly seasoned, or lubricated with a little butter, you can just as easily fry up breakfast. One of the best ways to make a classic camp breakfast is to start out by setting the strips of bacon in the middle area of the disk. Then fire it up to medium heat. As the FireDisk heats up it will start to render out some of the bacon’s fat, to fry the lean portions perfectly crispy, yet not overdone. Of course, the bacon grease will pool toward the center. When the bacon is done, you can pull it off and wrap the slices in a tinfoil pouch lined with some paper towels. At this point, you can take your spatula to carefully slosh a little grease up the sides to fry up some hash browns and home fries. You can use any other leftover bacon grease to fry eggs sunny side up. 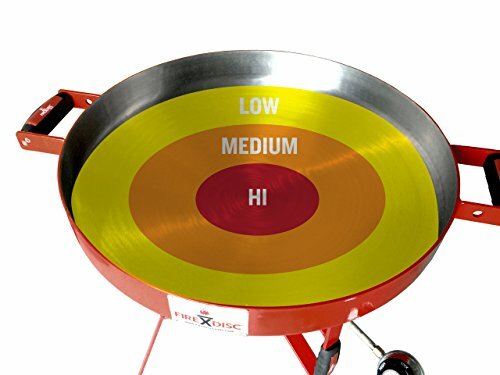 When you want to use it for stir fry, you need to keep in mind that the FireDisk develops a varying temperature range from the center of the disk above the propane flame. This means the middle of the disk will be hottest, and the outer ring near the griddle walls will be cooler, allowing you to use it just like a traditional Asian wok, without having to hand toss it. You simply move the various foods around with your silicone spatula. 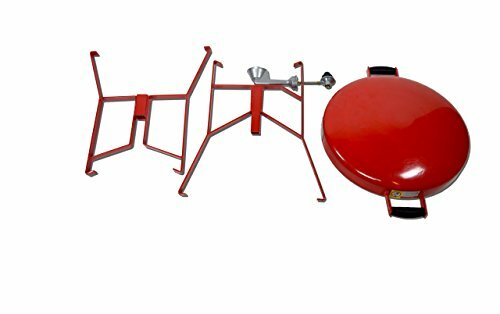 The BTI Outfitters FireDisk can also be used as a pan fryer. You simply pour a small amount (Less than 1.5 cups) of a high heat, neutral flavored oil, like peanut oil into the middle, and fire it up on medium-low heat. You don’t want to go with a full roar of flame as it could burn the oil. 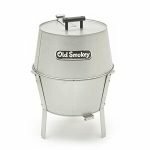 Temperature monitoring is important, as the FireDisk is capable of getting up to 450 degrees, which is above the smoke temperature of even high heat peanut oil. A digital read infrared thermometer is your best option for this. It fits comfortably in your pocket. You simply point it at the oil and the little red beam will read the temperature. If you are doing something like frying breaded fish fillets for shore lunch, the ideal target temperature is between 350 to 375 degrees. When you first add the food, check the temperature, as the cold food might lower the temperature a little. So long as it doesn’t drop below 325, you don’t need to increase the heat. In a minute or two, the temperature of the oil should rebound into the 350-degree range. 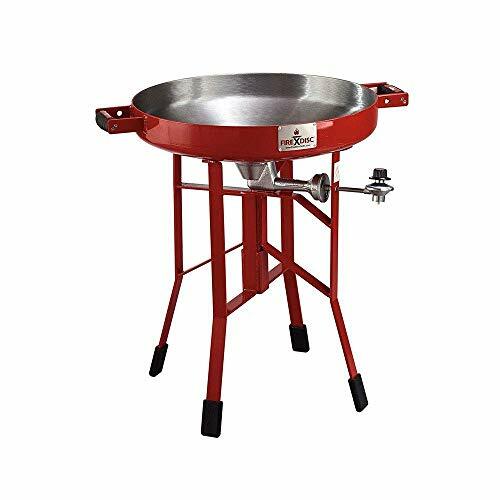 The Firedisk’s available cooking area measures in at just over a 22-inch diameter. This gives you just over 380 square inches of cooking space. 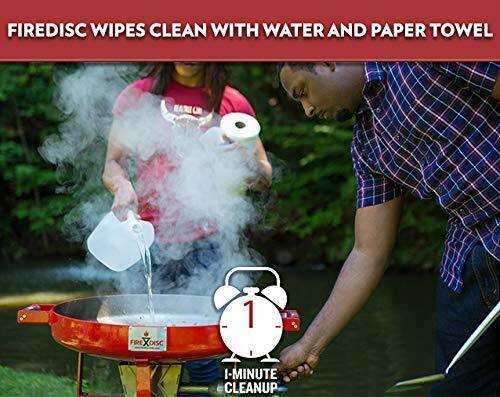 BTI Outfitters advocates two different ways to clean the 24-inch FireDisk. 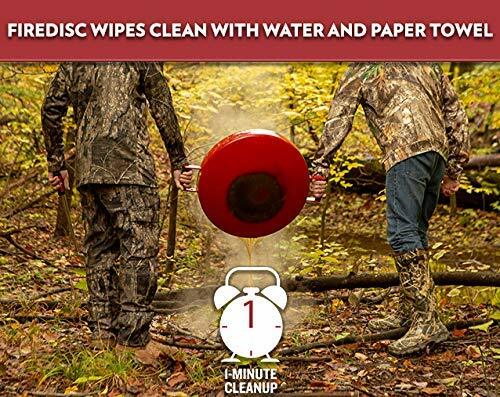 For someone who just wants to pack up camp quickly, you can wait until the disk cools down. Wipe away any excess grease, and then wash it with a clean, wet rag. However, this method could leave the cooktop surface vulnerable to long term issues with corrosion. The other method, of maintaining a seasoning layer, does take a little more effort. It starts with meticulously wiping away any remaining oil. Then applying a light coating of a shelf-stable oil like vegetable shortening or cold pressed flaxseed oil. At that point, you need to warm the FireDisk on medium-low heat for 10 to 15 minutes. Then let it cool down. Wipe away any traces of oil that pool in the middle. The BTI Outfitters FireDisk comes with a 5-year limited warranty. However, it only applies to the original purchaser, and they will likely require proof of receipt. This is a full head and shoulders above the competitors in this category. 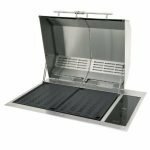 If you are looking for an outdoor griddle to use as your everyday patio grill, then there are likely other options you might be interested in. 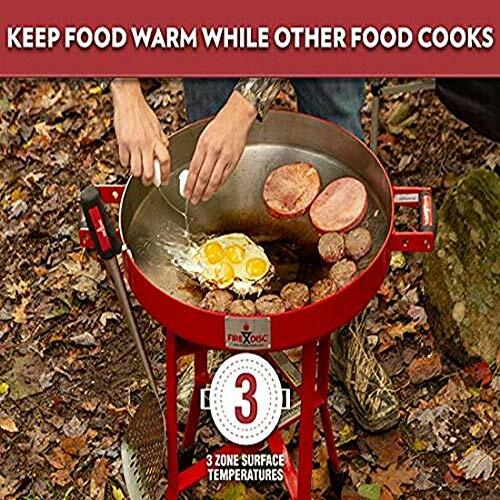 If you are looking for an outdoor cooking solution that you can easily take with you on vacation, camping, or tailgating, then the BTI Outfitters 24” FireDisk should be at the top of your list.